Happy Tuesday, y’all! I am finally home after a crazy weekend of snow and travel. We spent Saturday in Charlotte for our friends’ wedding and then I went straight to Atlanta for work and to spend a little time with my family. I can’t believe that the snow at my parents’ home still hasn’t melted. It’s so pretty! And we’re not going to sit still for long. Jeremy and I are trying to finalize plans to head to rent a cabin this weekend in the mountains. Nothing like waiting until the last minute! But I have been looking forward to sharing this look with y’all because I am beyond in love with this skirt. 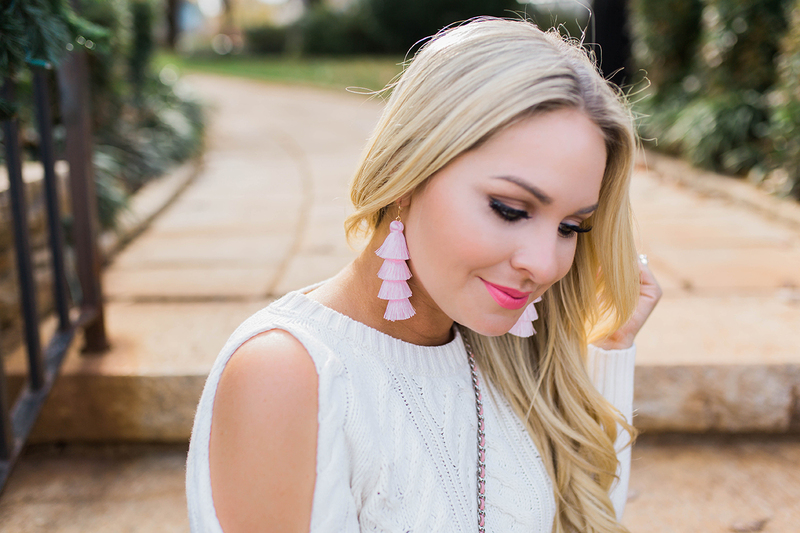 I typically gravitate toward traditional holiday colors this time of year, but I love how this Endless Rose mini went with blush pink instead. It runs true to size and is only $60. It’s perfect for pairing with pink Hunter Boots, which are currently 10% off. And speaking of sales, this cable-knit cold shoulder sweater is 50% off today. I’m wearing a size small and the length is perfect for wearing with all of your winter skirts. Beautiful looks!! you are looking so pretty in this pink shades! I love the knee length boots and earring❤ love how to showcasing this looks so modern styles. the hole is simply superb i think this is my dreamy outfits. thanks for sharing pink shades.